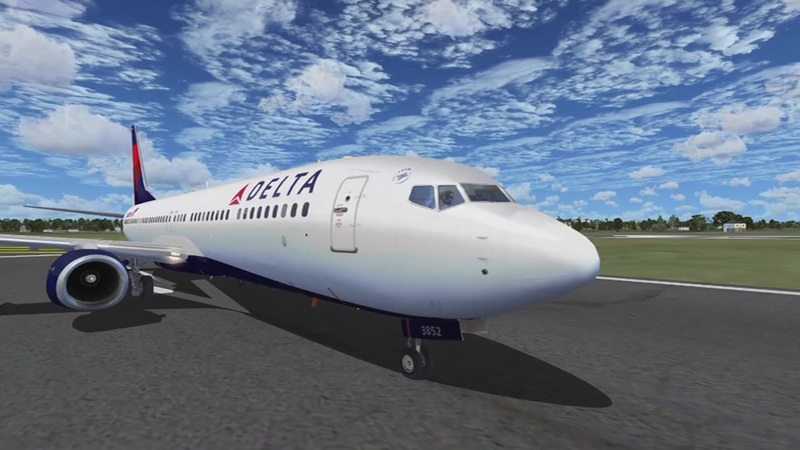 FS2004/FSX/P3D Delta Airlines Boeing 737-900ER, registration N852DN. New model included (TDS739ER_CFM56-7BE--LP2W3) with LED lights. The B737-900ER is developed by Tenkuu Developers Studio (TDS). Model design by Hiroshi Igami. Flight dynamics design by Nick Wilkinson and David Biggar. Master textures by Kyle Schurb. Delta Air Lines repaint by Carlos Eduardo Salas. The archive tds_737-900er_deltaairlines_n952dn.zip has 196 files and directories contained within it. I downloaded it and I solved the issue where it doesn't load, but then the CG and weight were messed up pretty badly. With flaps 10 I had to reach a speed of 260 knots before it even started to leave the ground. Also, the sound wasn't working and I had to use sound files from another model. Lastly, the aircraft has no navigation lights (common problem with the default 737-800 in FSX) so you have to look for a fix. Is there a virtual cockpit for this? Has anyone successfully got this aircraft to load and fly? I extracted all contents to the FSX airplane folder and moved "Effects" to the proper FSX effects folder. When I try loading the plane in free flight, an error message comes up.